Jolo, Philippines (AP) — Two bombs minutes apart tore through a Roman Catholic cathedral on a southern Philippine island where Muslim militants are active, killing at least 20 people and wounding 111 others during a Sunday Mass, officials said. Witnesses said the first blast inside the Jolo cathedral in the provincial capital sent churchgoers, some of them wounded, to stampede out of the main door. Army troops and police posted outside were rushing in when the second bomb went off about one minute later near the main entrance, causing more deaths and injuries. The military was checking a report that the second explosive device may have been attached to a parked motorcycle. 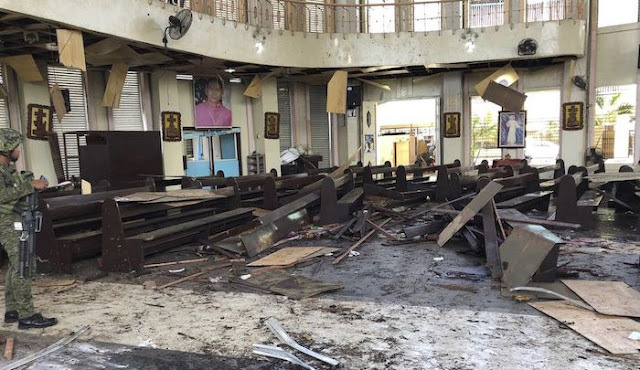 The initial explosion scattered the wooden pews inside the main hall and blasted window glass panels, and the second bomb hurled human remains and debris across a town square fronting the Cathedral of Our Lady of Mount Carmel, witnesses said. Cellphone signal was cut off in the first hours after the attack. The witnesses who spoke to The Associated Press refused to give their names or were busy at the scene of the blasts. Police said at least 20 people died and 111 were wounded, correcting an earlier toll due to double counting. The fatalities included 15 civilians and five troops. Among the wounded were 17 troops, two police, two coast guard and 90 civilians…. Jolo island has long been troubled by the presence of Abu Sayyaf militants, who are blacklisted by the United States and the Philippines as a terrorist organization because of years of bombings, kidnappings and beheadings. A Catholic bishop, Benjamin de Jesus, was gunned down by suspected militants outside the cathedral in 1997. No one has immediately claimed responsibility for the latest attack. It came nearly a week after minority Muslims in the predominantly Roman Catholic nation endorsed a new autonomous region in the southern Philippines in hopes of ending nearly five decades of a separatist rebellion that has left 150,000 people dead. Although most of the Muslim areas approved the autonomy deal, voters in Sulu province, where Jolo is located, rejected it. The province is home to a rival rebel faction that’s opposed to the deal as well as smaller militant cells that not part of any peace process….